Pump and Filter Issues – The purpose of the pump and filter is to keep the water circulated and cleaned to avoid algae growth and other problems that will make it unsafe to swim. To keep these in working order, it is important to keep the water balanced and keep excess debris from entering your pool. The skimmer basket will keep larger debris, such as leaves and pet fur, from reaching the pump and filter but it will only do its job if you clean it regularly. It isn’t a bad idea to manually skim the surface if you see a lot of floating debris. If you allow your dogs in the pool, give them a brushing first to minimize how much fur gets in the pool. Stained Pool – In-ground pool surfaces can become stained and ugly over time, requiring resurfacing to bring it back to life. You can avoid this by using an automatic pool vacuum to keep debris off the bottom and sides. If you don’t have one, be sure to brush and vacuum regularly. It is also important to keep the water balanced to avoid damage to the pool. Be sure you understand the balance needed for the material your pool was constructed with. 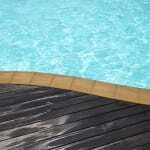 Pool Liner Issues – If your pool has a liner, you want it to last as long as possible. You can avoid swimming pool repair or even replacement of the liner by adding chemicals one at a time, so they can circulate before adding the next. Always keep an eye on the water chemistry to avoid a problem. Also, be sure to keep sharp objects out of the pool. If you find that despite your best efforts, you need swimming pool repair, give us a call at S & H Pools. We have served the area since 1974 with reliable and effective pool services and are always happy to advise you about how to preserve your swimming pool.